This report was published by the University of Maryland’s research program with the Department of Homeland Security called the National Consortium for the Study of Terrorism and Responses to Terrorism (START). 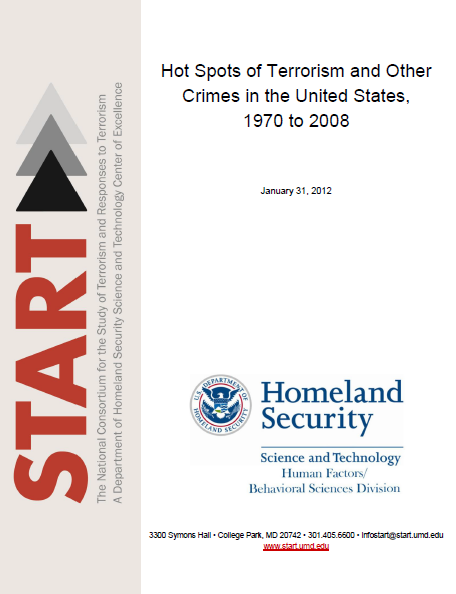 The report contains a section excerpted from another START report called “Profiles of Perpetrators of Terrorism-United States” that states that being “fiercely nationalistic”, “suspicious of centralized federal authority”, “reverent of individual liberty” and believing in conspiracy theories are all traits relative to ideological motivations for terrorism. Thanks to Washington’s Blog for pointing the report out to us. While efforts are increasingly aimed at understanding and identifying “hot spots” of ordinary crime, little is known about the geographic concentration of terrorist attacks. What areas are most prone to terrorism? Does the geographic concentration of attacks change over time? Do specific ideologies motivate and concentrate terrorist attacks? Moreover, what factors increase the risk that an attack will occur in a particular area? Using recently released data from the Global Terrorism Database, we address these gaps in our knowledge by examining county-level trends in terrorist attacks in the United States from 1970 through 2008. The definition of terrorism used by the GTD is: the threatened or actual use of illegal force by non-state actors, in order to attain a political, economic, religious or social goal, through fear, coercion or intimidation. It is important to note that the classification of an event as terrorism depends as much on threats as the actual use of violence. For example, instances in which individuals seize an aircraft and threaten to blow it up unless their demands are met are defined as terrorist events. Note also that by specifying the threatened or actual use of force the definition of terrorism used by the GTD excludes hoaxes. The requirement that these events be limited to the actions of “non-state actors” means that considerable violence and terrorism that is directly attributable to states or their militaries is also excluded. And the requirement that the act have a direct political, economic, religious or social goal means that ordinary criminal violence is excluded. Thus, the GTD excludes state terrorism and many types of crime and genocide, topics that are important and complex enough to warrant their own separate analysis. 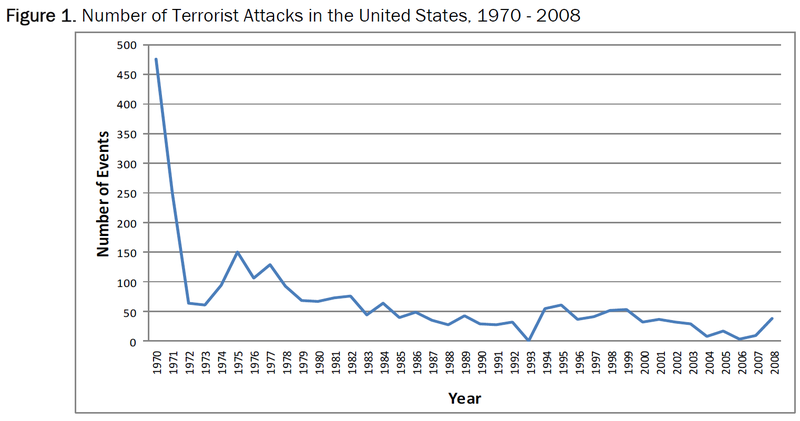 The frequency of terrorist acts is recorded for each U.S. county for each year from 1970 through 2008. Counties with no recorded terrorist attacks are coded “zero.” The vast majority of U.S. counties have not experienced any terrorist attacks since 1970. Terrorist acts are also categorized by the ideological motivation of the act and coded as “extreme right-wing”; extreme left-wing; religious; ethno-nationalist/separatist; or single issue. The dominant ideology variable captures the group’s central ideological motivation (e.g., while the Aryan Nations maintained a strong religious conviction to the Christian Identity movement, their raison d’être was to promote a racially homogenous white society). Religious: groups that seek to smite the purported enemies of God and other evildoers, impose strict religious tenets or laws on society (fundamentalists), forcibly insert religion into the political sphere (e.g., those who seek to politicize religion, such as Christian Reconstructionists and Islamists), and/or bring about Armageddon (apocalyptic millenarian cults; 2010: 17) For example, Jewish Direct Action, Mormon extremist, Jamaat-al-Fuqra, and Covenant, Sword and the Arm of the Lord (CSA) are included in this category (2011: 18). Ethno-Nationalist/Separatist: regionally concentrated groups with a history of organized political autonomy with their own state, traditional ruler, or regional government, who have supported political movements for autonomy at some time since 1945 (2011: 18). Single Issue: groups or individuals that obsessively focus on very specific or narrowly-defined causes (e.g., anti-abortion, anti-Catholic, anti-nuclear, anti-Castro). This category includes groups from all sides of the political spectrum (2010: 28).